Amy Emmerich is the Chief Content Officer at Refinery29, the leading digital media company for women with an audience footprint of over 500 million across all platforms. 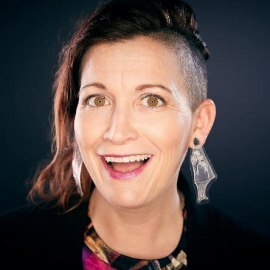 She has more than 20 years of experience developing content and programming for brands including Refinery29, MTV Networks, Travel Channel, and Vice Media. An Emmy award-winning producer, she has a full spectrum of production and development experience across platforms, including linear television, digital video, and social media, and is committed to creating a dialogue that matter most to a new generation of powerful women. As CCO, Amy oversees all Refinery29 content and is focused on driving strategy and expanding distribution across channels as the brand scales globally. Amy has launched several original series at Refinery29 including Short Cuts, Riot and , which premiered at the 2016 Sundance Film Festival and earned a Webby award. In 2016, Refinery29 launched the ShatterBox Anthology Series, a short film initiative that provides emerging female filmmakers with the support and opportunity to realize their visions and reach new audiences. The films have premiered at festivals globally,  including Cannes,Sundance, and SXSW. Prior to Refinery29, Emmerich served as vice president of production at Vice Media, where she contributed to the launch of two successful YouTube channels while organizing international creative efforts and overseeing production teams across multiple verticals. Before Vice, she was the VP of production and development for the Travel Channel, where she oversaw all network programming. Emmerich’s career also includes producer roles at HBO and Oxygen Media. Amy is married and lives in Manhattan  with her husband and two children.